Maybe I just need the accountability, but when I thought and prayed about a word – one came LOUD and CLEAR. Those who know me well may laugh at this. I’m never at a loss for words. But I do try to be thoughtful about what I say, whether it be verbal or written – sometimes to a fault. 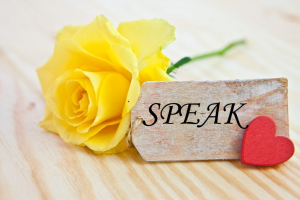 Sometimes I let fear stop me from SPEAKING – from putting my words out into the world. I’m going to SPEAK into the lives of others with words of encouragement, kindness, and challenge. I’m going to SPEAK with thoughtful written words in cards, letters, on social media, in my journal and on my blog. I’m going to SPEAK words of love and kindness to myself – in the form of sleeping when I’m tired (gasp! ), eating (mostly) healthy foods, and moving in meaningful and challenging ways. I’m going to SPEAK words of honesty and worship to my GOD. And I’m going to LISTEN when words are whispered back into my soul from this mysterious SPIRIT. Then I’m going SPEAK again through my actions – rather than resting in unfulfilled good intentions. I don’t know where all this SPEAKING will lead, but I’m going to honor the journey. I’ve always admired those who speak the truth regardless of the consequences, and I believe you should never compromise your beliefs, values, and commitments for the benefit of others. In a complex world of bigotry, and intolerance, I believe that apathy and indifference are the greatest diseases affecting mankind. Kindness and integrity are words that define those like Becky and you and will always be heard by those like me, who desire to inspire. I share and love your words.